Aggression in dogs is one the leading reasons why people contact me for help. One of the most common emotional issues animals often experience is the emotional frustration of being misunderstood. Regardless of where they have come from and what they’ve suffered or experienced, what they need from you is your respect, your willingness to communicate with them to find out from them what is going on, your understanding and lack of judgment, followed by providing a foundation of stability in their home. Well intentioned, loving animal owners often do exactly the wrong things in their attempt to help these animals. They do not need affection or a stronger more forceful approach as much as they need direction and a way to feel safe in a secure family group. They also need jobs to do, a way to focus their energy and spirit so they can fulfill their purpose here. A fearful animal does not need you to protect them. They need you to help them find their confidence again. It is cruel to let an animal live in fear. If you love them, then teach them what they need to know to not be afraid anymore. An aggressive animal is usually in reaction to something their human has inadvertently taught them – they can sense when you are frightened or feel out of control, so they will take over trying to protect you! Every family group needs a leader, someone in control who can be trusted. An example of aggressive behavior that backfired was when a dog was attacking a friend’s husband, and the dog would not even let him into their bedroom. It was a tense situation and they desperately needed help before they had to put their dog down. After communicating directly with the dog it turned out the marriage was in trouble and the dog was acting out the wife’s anger toward her husband. If they had not taken the time to listen to their dog, he would have lost his life. The dog thought he was doing the right thing. Now that they knew what the real trouble was, they could give him different signals, and he didn’t have to suffer or die. Many animal lovers simply do not realize when their animals are reacting to something that is going on in the home. If you are ill, stressed, addicted to drama and/or not a good leader then the animals in the house will react accordingly. Their world view is vastly different than our own. They need to have a leader, feel safe, have adequate food, share affection, be in a pack of some type and be allowed to fulfill their purpose in this lifetime. When these basic things are not met, then they will do whatever makes the most sense to them at the time, which may include acting out. Sometimes the only way to determine the root cause of a behavior issue to ask the animal directly why they are misbehaving. Many times it is not an obvious answer, but one that you would never have thought of. Do you want to learn how to talk to your dog? The World’s 1st Complete How To Talk To Animals, The Complete System: Core Foundations Home Study Course – for dog lovers! This unique life changing course helps you learn how to talk to your dog! Change bad behavior and resolve problems, learn if your dog is happy or sick or in pain, listen to the wisdom and discover your dog’s viewpoint. 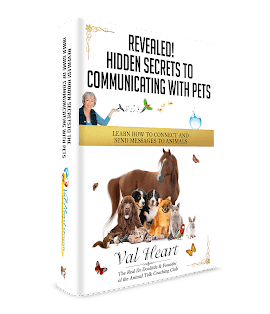 16 cds and Study Guide Workbook of over 160 pages gets you started in no time — with special bonuses including Val’s Introducing Animal Communication Home Study Course!